FirstGroup wanted to meet its of goal of reducing its CO2 emissions by 100,000 tons while improving passenger safety and comfort. FirstGroup plc is the world’s leading transport operator with revenues of over £6 billion. It employs some 136,000 staff throughout the UK and North America and transports more than 2.5 billion passengers a year. FirstGroup is Britain’s largest bus operator, running more than one in five of all local bus services and carrying 3 million passengers a day in more than 40 major towns and cities. 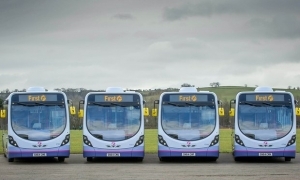 As the UK’s largest bus operator, FirstGroup believes it has a responsibility to lead the market in making its fleet the most fuel efficient and the safest in the UK. As part of its global initiatives, FirstGroup wanted to meet its of goal of reducing its CO2 emissions by 100,000 tons while improving passenger safety and comfort. By rolling out a driver behavior initiative across its national fleet, FirstGroup anticipated meeting its goal of reducing its CO2 emissions by 100,000 tons. Research shows that driving decisions are responsible for up to 33 percent of fuel spend. By enabling better decisions, FirstGroup knew that systems like GreenRoad not only improve fuel consumption, operational efficiency, and vehicle wear-andtear they also help to improve passenger satisfaction and lower insurance costs. After a wide search, FirstGroup selected GreenRoad. FirstGroup initially implemented GreenRoad across its fleet of 9,000 buses in the UK and Ireland to deliver real-time driver feedback and targeted optimization insights. GreenRoad continuously measures maneuvers that most impact safe driving, fuel efficiency and emissions, and gives drivers instant feedback in order to correct themselves in real time. On returning from routes, drivers and depot managers can view online the overall quality of their driving. A score is allocated to each driving session, giving drivers the opportunity to improve their driving and help play their part in tackling environmental issues. Fleet tracking information is also monitored and analyzed to optimize fleet operations. First and GreenRoad worked together to ensure that drivers understood that the program was beneficial to them and empowered them to their job better and more environmentally-friendly. Indeed, the drivers’ unions have seen the benefits of GreenRoad. The nationwide roll out to the entire fleet of 9,000 buses reported an almost 70% drop in risky maneuvers – from an average of 80 risky maneuvers per 10 hours to an average of 26. Collisions were reduced by more than six percent. Because they are driving with greater attention, drivers are using less fuel and lowering emissions, to the point where First believes it is possible to hit its three-year target of reducing emissions. For passengers, there is the obvious benefit of increasingly smooth and comfortable journeys. Passenger injuries have been reduced by over eight percent. Smoother driving also means better fuel economy, especially in a large vehicle such as a bus in which keeping momentum constant is crucial. And better fuel economy means lower operating costs, which helps keep fares down.